Cheniers are separated by wide intertidal or shallow subtidal mudflats, much wider than the ridges, covered by wetland vegetation. Low-lying interior inter-ridge flats may occasionally be submerged by high tides or river floodwaters to form brackish or fresh water wetlands. Intervening areas may even be barren of vegetation or covered at least in part by grasses, salt marsh, freshwater swamp, or mangroves. 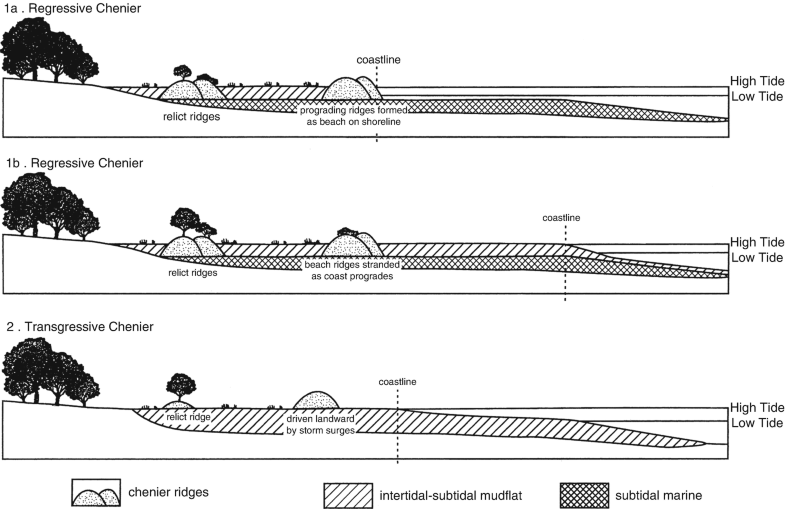 Misidentification can happen when inter-ridge swales (lows) in a (non-chenier) ridge plain are filled by fine-grained peaty alluvial or delta deposits, covered by recent wetland vegetation. 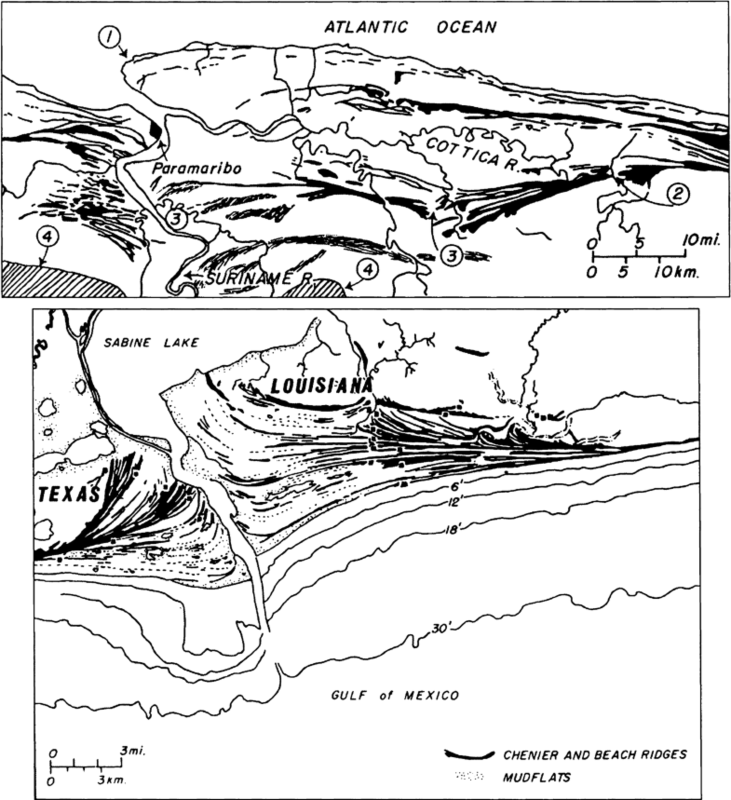 The term chenier plain includes both the inter-ridge flats and the chenier ridges, where at least two successively formed ridges are present (Otvos and Price 1979). The latter caveat has unfortunately, occasionally has been disregarded. 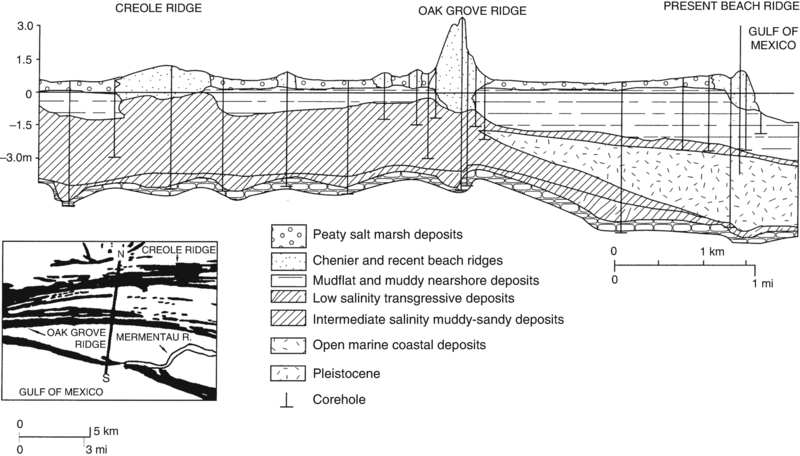 The term was misapplied to beaches capped by shell-concentrate berm ridges at high-tide level where the beach foreshore faces low intertidal mudflats along the ocean shore (e.g., Neal et al. 2002; Weill et al. 2012). Equally inappropriately, a “chenier” designation was also applied in at least one highly dynamic setting with significant ebb and flood tidal action. Prograding arms of constantly changing, low intertidal sand bar ridges in this small estuary have been migrating over and surrounded small areas of intertidal-subtidal mud flats (Morales et al. 2014).